Yesterday when I was buckling my little guy in to the car he reached up, kissed me and said, "you're the bestest Mom ever!" Well that certainly made my day! But I didn't have the heart to tell him that my Mom is actually the bestest Mom ever. She is probably about the nicest person you could ever meet and everyone who knows her just loves her. I certainly know my kids think that Granny is about the best thing since sliced bread. I must warn you though - the list of people wanting to be adopted is already quite long. So today's post is all about Mom. 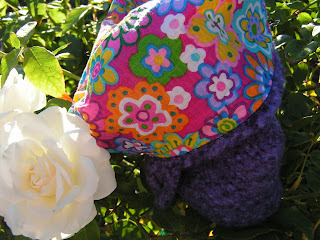 She has recently been making these wonderful hats out of some chunky yarn called Jumbo Merino. They are so adorable. 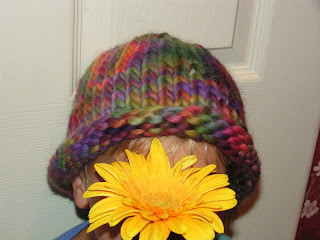 You may wonder about the hat thing - could knitting choices be hereditary? As they say, "insanity is hereditary - you get it from your kids!" 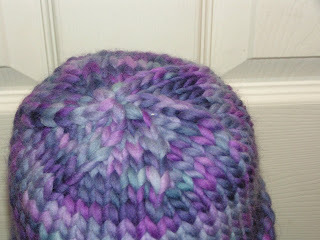 In addition to her cute hats, my Mom has found time to line the felted bags I have been making. I think bags look great when lined - it really finishes them off. But unfortunately I don't sew. So every now and again I impose upon Mom to line them for me. Recently she lined three. I think she did a great job and I just love the fabrics. 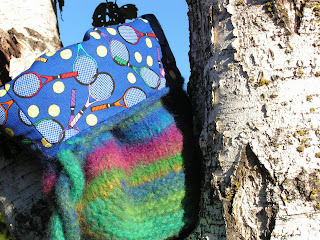 She found some perfect tennis fabric for the noro Sophie bag which I made for my friend who is as obsessed about tennis as I am about knitting. 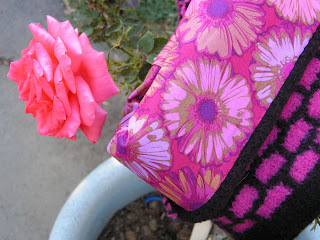 The purple Sophie got some wild te floral fabric I found at JoAnn's and then Mom found the perfect pink floral fabric to complement the brown and pink ballband bag. THANKS MOM! Isn't she wonderful???!!! Yes, your mom is the best and quite the seamstress as well. The bags she lined for you are absolutely gorgeous! I was blessed with a very special mom as well, but unfortunately she is no longer with us. For the past 7 years -a day has not gone by that I have not thought of her or missed her terribly. I hope my status on that to-be-adopted list is inching up. Those bags are simply adorable. And so are the hats. Yes, you have a wonderful mom. Glad I'm on the 'waiting to be adopted' list! ;-) I love the linings of all the bags.. and you're right, it does finish them off so nicely! Mom's are great - what a nice tribute to yours. I love the linings. I think I used some of that daisy material for something I made! The items you have knitted are absolutly wonderful. You and your mother are very talented. I am lucky also my mother is always there helping me with my knitting and my mother in law is helping with my sewing. Have a great day.